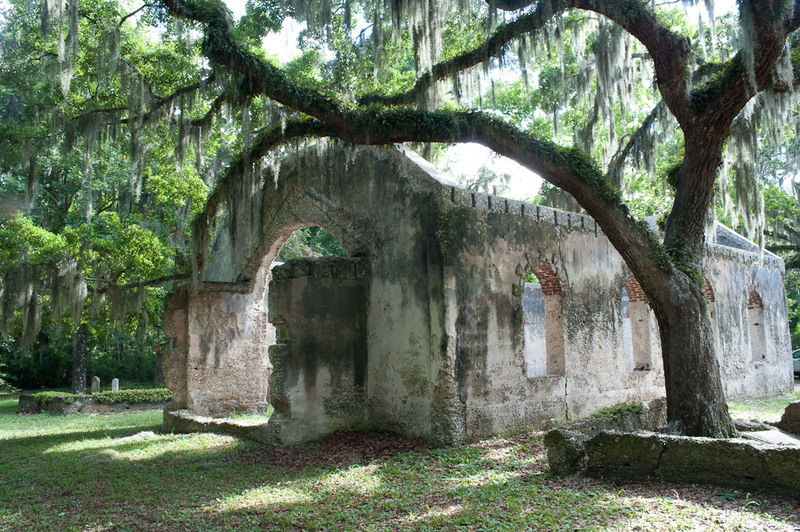 Music, song and dance, were a sanctuary for the Gullah during slavery times. Singer Marlena Smalls uses traditional music to celebrate and preserve the West African heritage that shaped Gullah culture. Music is an important conduit of culture, and links people to community to their ancestors and to the land. You can type in the “Story” text here. 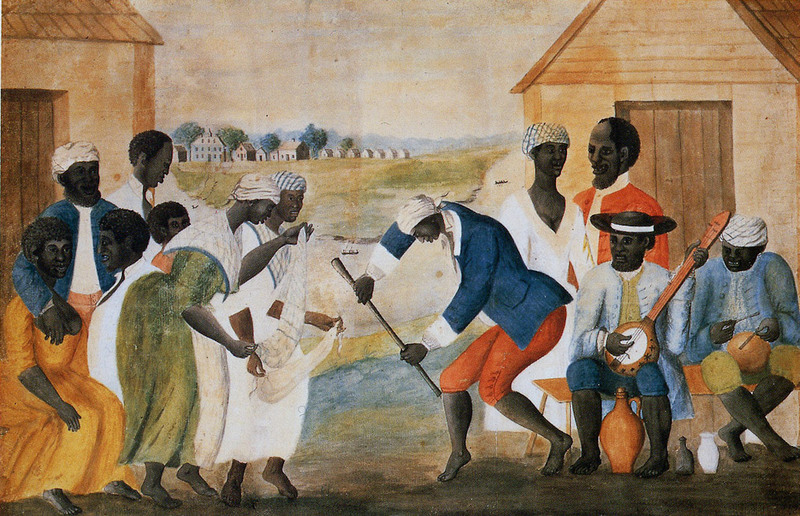 Plantation Dance, South Carolina, 1785-1795. This small watercolor painting is probably the best known depiction of life in the slave quarters during the 18th century. 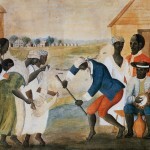 The painting shows a scene of plantation slaves dancing and playing musical instruments. The artist was John Rose, a South Carolina plantation owner on the Coosaw River, in the area of Beaufort. The background shows a river with two canoes, and a group of larger buildings, including the plantation house, outbuildings, and a row of seven slave cabins. 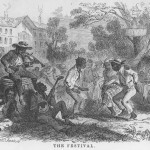 Image reference NW0159, www.slavery images.org, Virginia Foundation for the Humanities and the University of Virginia Library. Corn Shucking, South Carolina, 1852. 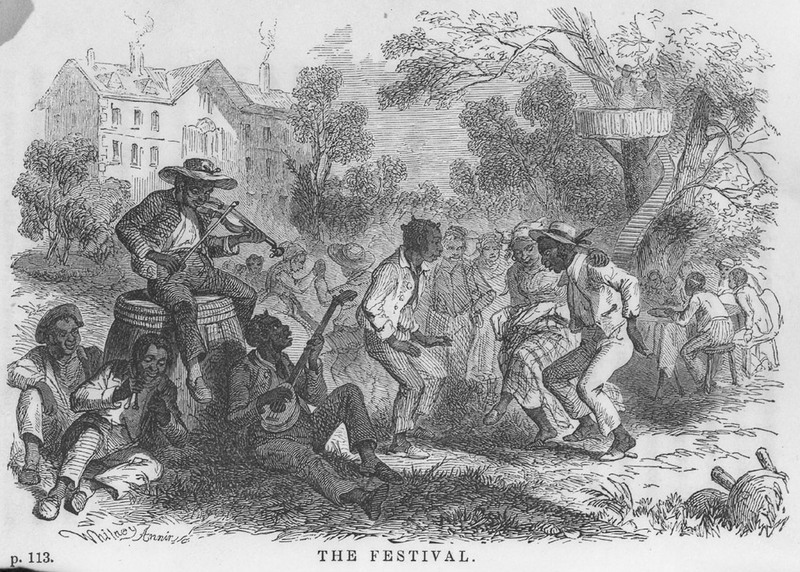 Music was an important part of work during slavery. This engraving from Robert Criswell's novel "Uncle Tom's Cabin" contrasted with Buckingham Hall, portrays a "corn-shucking" or husking. While it is a pro-slavery novel, and tends to depict slavery as a benign institution, there is some truth to the practice depicted here. The text describes the husking: " That evening the "corn-shucking" or husking, came off. The corn was piled in large heaps before the row of cabins,.... Around the large corn heaps were seated over two hundred men and women, (many of whom were from the neighboring plantations,) tearing off the husks and throwing the ears into separate piles; and in the midst of their employment all were chattering, laughing, singing and telling stories.... On the top of one of the heaps was mounted uncle Cato .... He was noted for his talent of improvisation. He would sing one or more lines of a song and the chorus would be repeated by all the others." Robert Criswell, 1852. 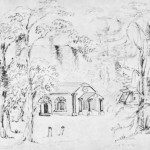 "Uncle Tom's Cabin" Contrasted with Buckingham Hall, the Planter's Home; or, A Fair View of Both Sides of the Slavery Question (New York: D. Fanshaw) http://utc.iath.virginia.edu/proslav/prfirca12t.html; Image LCP-61, www.slavery images.org, Virginia Foundation for the Humanities and the University of Virginia Library. This engraving from Criswell's novel shows a festival held on the return of a member of the planter's family in South Carolina. The image shows the use of the banjo, fiddle and bones. Image LCP-62, www.slavery images.org, Virginia Foundation for the Humanities and the University of Virginia Library. 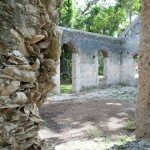 The ruins of the Chapel of Ease is a popular site today for visitors and local weddings. 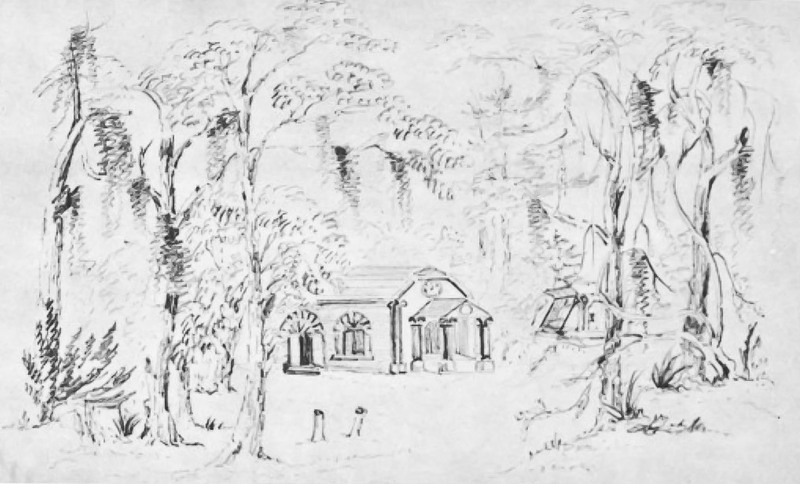 You can see the outline of the portico roof in the front face of the church (compare with the 1860's sketch, and one of the remaining columns from the portico. 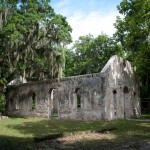 During the Civil War most of the white people on the island - Northern colonists - withdrew from the central Brick Church and began to hold services there. 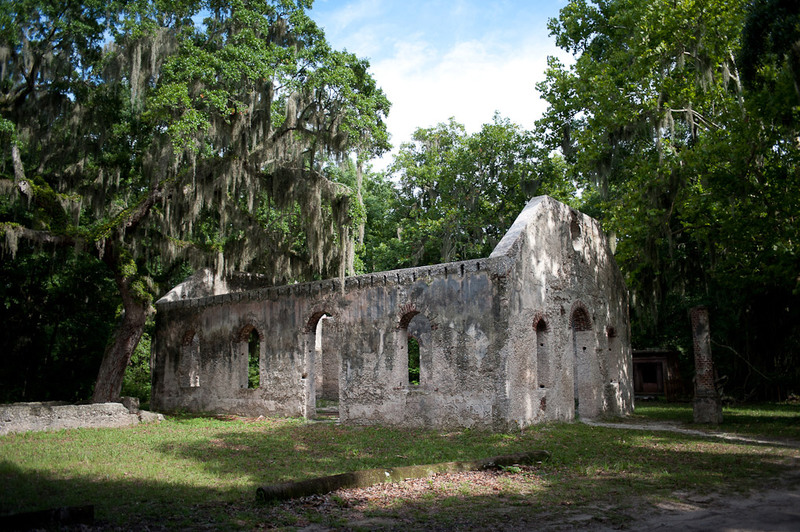 From this the island people began to call the little Episcopal church the "white church." 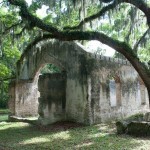 The chapel burned in 1886 and was never rebuilt. Image Folder P-4285/02, in the Edith M. Dabbs Collection of Papers Relating to Saint Helena Island, S.C., Southern Historical Collection, The Wilson Library, University of North Carolina at Chapel Hill. 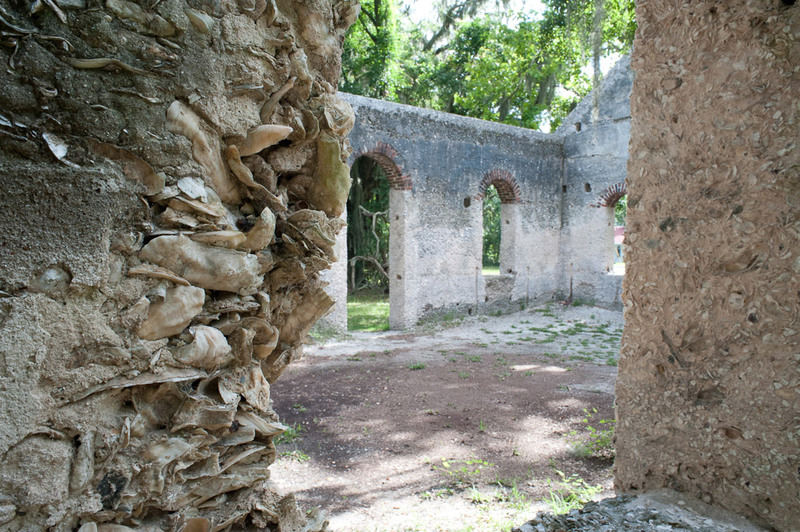 Looking closely, the use of the local building material of tabby - cement made from oyster shells - can clearly be seen in the walls of the Chapel of Ease. A view of the rear of the Chapel of Ease.